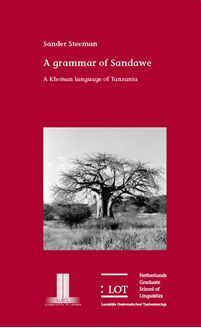 This book presents a description of Sandawe, a Khoisan language spoken by approximately 60 000 speakers in Dodoma Region, Tanzania. The study presents an analysis of the phonology, morphology, and syntax of the language, as well as a sample of four texts. The data for this dissertation were gathered by the author during fieldwork in the area where the language is spoken. The language has a rich phonology, with sets of lateral fricatives and affricates, ejectives, and fifteen clicks. The nominal domain is characterized by the absence of regular number marking. The verbal domain, on the other hand, shows various ways of number marking, which can express participant plurality and pluractionality. The study further provides a comprehensive description of the morphology and semantics of verbal derivation, such as iterative, factitive, causative and middle stems, and verbal case markers that introduce an additional pronominal object. Sandawe has various types of clitics, notably subject/modality markers and mediative clitics, which have a variable position in the clause. A grammar of Sandawe is of relevance to specialists in Khoisan studies as well as to general linguists and typologists interested in number marking, verbal derivation, and clitics.